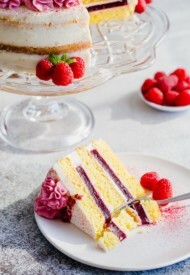 Delicate sponge cake layers filled with creamy sweet cream cheese frosting and raspberry jello made with real fruits. Gorgeous, tall and impressive cake for any occasion. My goodness, I’m so excited to finally share this amazing cake recipe with you today. 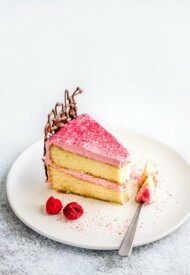 I made this raspberry cake couple of weeks ago and it was truly a delight to make, eat and photograph it. I’d totally do it again and again. And I really wish I had a slice with me while I write this post! 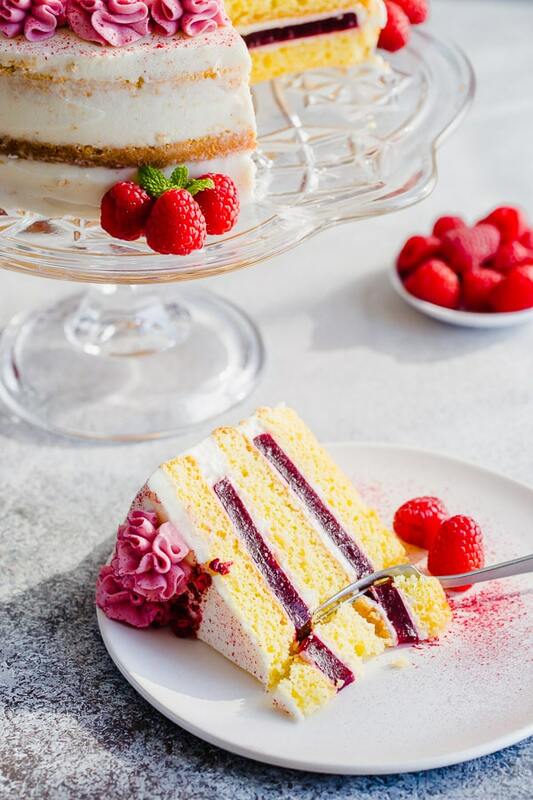 While this raspberry cake consists of multiple components, like cake layers, frosting and raspberry jello, I can assure you it’s not very difficult to make. In fact, if I can make it while chasing 3-year-old toddler and holding a baby (chunky baby, I may add! ), you can totally do it too. Kidding, I did have some help with my kids. But the point is it’s easy to make the cake. Just plan it ahead and break the project into mini-projects. Bake the cake and make simple syrup on day 1. Then on day 3, whip up the frosting and assemble the cake. By the way, this raspberry jello may sound so weird, but trust me, this’s good stuff! It’s a fun surprise when you cut into the cake! Raspberry jello is not super sweet and overpowering like a raspberry jam or jelly. 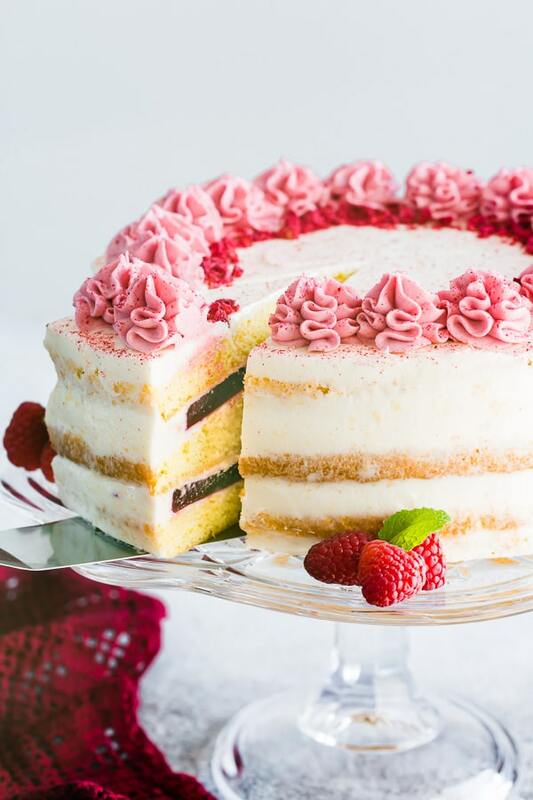 It’s delicate with a burst of fresh raspberry flavor! It adds so much flavor and texture to the cake. We loved it! 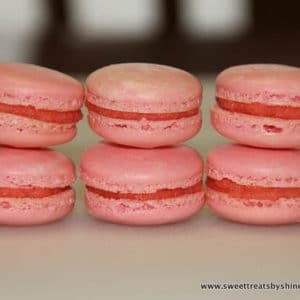 How to make raspberry jello with real berries? No need to turn to boxed stuff here. It’s simple to make raspberry jello from scratch. Both fresh or frozen raspberries will work here. First, we’ll cook raspberries and sugar slowly until sugar is completely melted. Then we’ll add hydrated gelatin into the berry mixture and continue to cook the mixture until gelatin is dissolved. 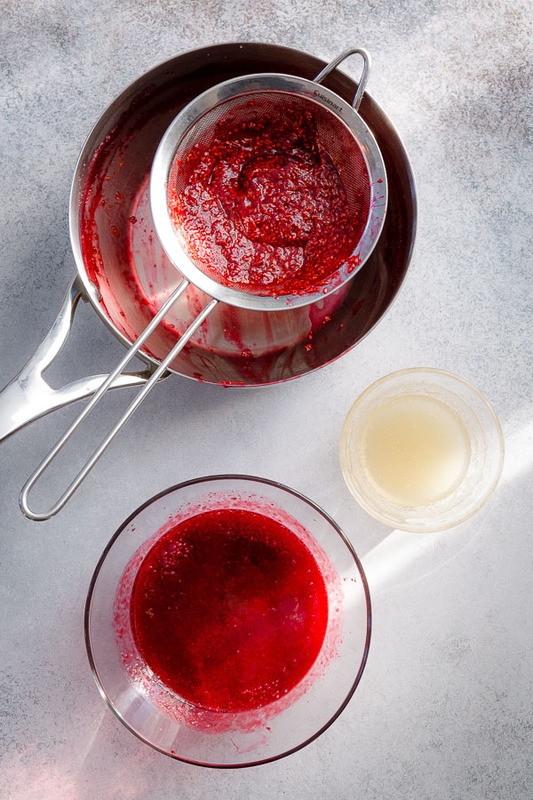 Finally, run the raspberry puree through a sieve to remove the seeds and divide into the oiled pans to set. 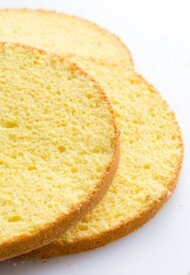 I’ve shared a detailed process on making perfect sponge cake here. So we’ll skip the details on that today and jump right into assembling the cake. 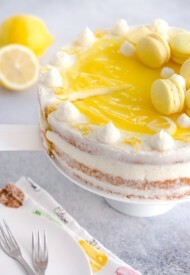 We’ll cut the cake into 3 layers, and soak them generously with simple syrup! Simple syrup is not optional, it’ll make the cake so tender and soft. Don’t skip it! Then fill the cake layers with cream cheese frosting. TIP: It’s much easier to fill the cake you put the frosting into a piping bag. Cream cheese frosting is a beautiful combination in this cake. So creamy and delicate! And here’s that beautiful raspberry explosion! Pictures worth thousands words, so here are some photos to show you how I fill the cake layers. We’re putting cream cheese frosting on both sides of the jello. No skimping on frosting here! Now decorate the cake however you would like. 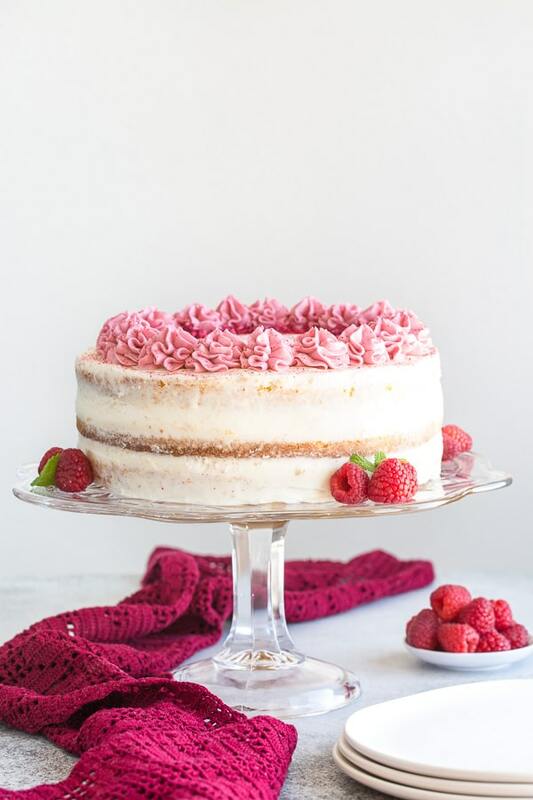 I used this freeze-dried raspberry powder in the leftover cream cheese frosting to decorate the top of the cake. And I also sprinkled some crushed freeze-dried raspberries on top. 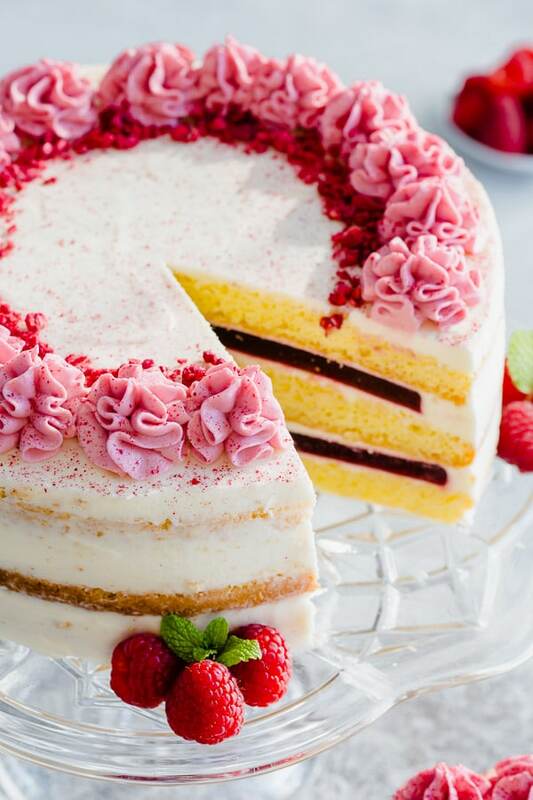 You can also fill the entire cake with raspberry cream cheese frosting for even more raspberry flavor. The cake turned out beautiful, if I can say so myself, and I could not stop taking pictures of it. So here are a few more shots of the cake for your viewing pleasure. Enjoy! To make the cake, preheat the oven to 350°F (177°C). Line bottom of 1 9-inch springform pan (at least 3 inches tall) with parchment paper. No need to grease the pan. In a mixing bowl with whisk attachment, whisk together egg yolks and ½ cup of sugar until pale and tripled in volume, about 5 minutes. Meanwhile, sift flour and salt. In another mixing bowl with whisk attachment, beat egg whites at medium low speed until foamy. Stir in cream of tartar, if using. 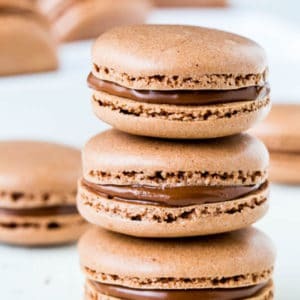 Add remaining ½ cup of sugar 1 tablespoon at a time and continue to whisk until stiff peaks, gradually increasing the speed to medium high, 7-10 minutes. Using a spatula, add 1/3 of the whipped egg whites into the egg yolk mixture and gently fold until mostly smooth. Add the remaining egg whites and gently fold until smooth. Add sifted flour into the batter in 3 stages, whisking the batter well after each addition. Pour the batter into prepared pan and smooth the top. Bake the cake until inserted toothpick comes out clean, about 40 minutes. Don’t open the oven for at least the first 30 minutes! Let the cake cool for 5 minutes in the pan. Then run a knife around the edges and invert onto a cooling rack. Cool completely. 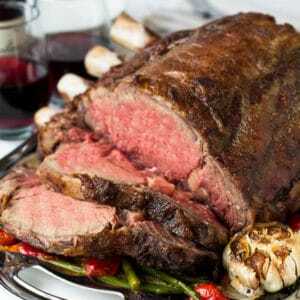 Once cooled, wrap with plastic wrap and refrigerate, preferably overnight. It’ll be easier to slice it when the cake is thoroughly chilled. To make raspberry jello layer, spray two 7-inch round cake pans with a cooking spray. In a small bowl mix together gelatin powder and water. Let it sit for 5 minutes. In a small saucepan, combine raspberries and sugar. Cook it over medium high heat, until sugar is melted, stirring frequently and mashing the berries. Stir in gelatin and cook over medium low heat until the gelatin is fully melted. Run the mixture through a sieve to remove seeds. Divide the mixture into the prepared pans. Refrigerate for 2-3 hours, or overnight to set. To make the simple syrup, in a small saucepan, combine 1 cup water, sugar and lemon juice. Bring it to a boil and simmer until sugar is fully dissolved. Remove from heat and cool completely. To make the cream cheese frosting, beat cream cheese and butter on medium high speed until fluffy, about 1 minute. Add powdered sugar and vanilla extract. Beat on low speed for a minute. Then increase the speed to medium high and continue to beat until smooth and fluffy, about 3 minutes. Transfer the frosting into a large frosting bag. You can use a round piping tip, if you have it, but it’s not necessary. 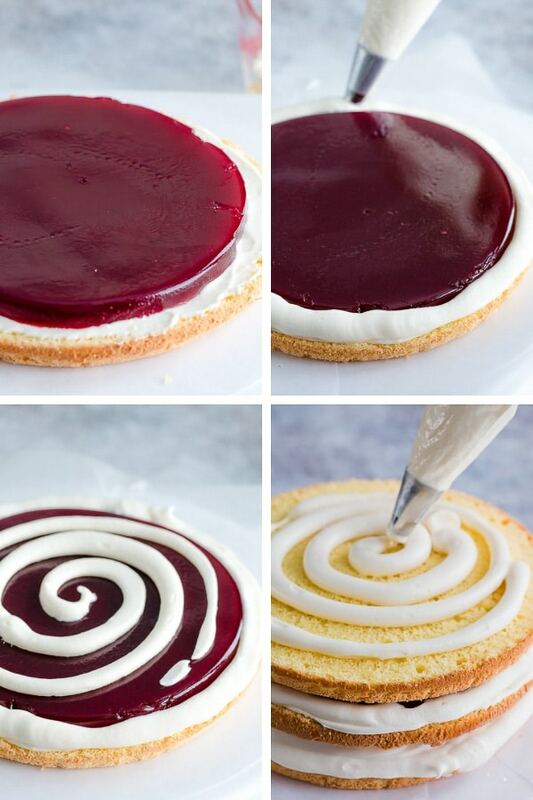 Place the bottom cake layer on a serving platter. (TIP: Place 3 strips of parchment or wax paper on the bottom to keep the serving platter clean.) Brush on 1/3 of chilled simple syrup evenly on the cake. Pipe the cream cheese frosting all over and smooth it with an offset spatula. Place the raspberry jello in the middle. Pipe frosting around the jello, creating a border. Pipe more cream cheese frosting over the jello and spread evenly with an offset spatula. Place the next cake layer and repeat. Place the top cake layer upside down so that the top of the cake is nice and flat. 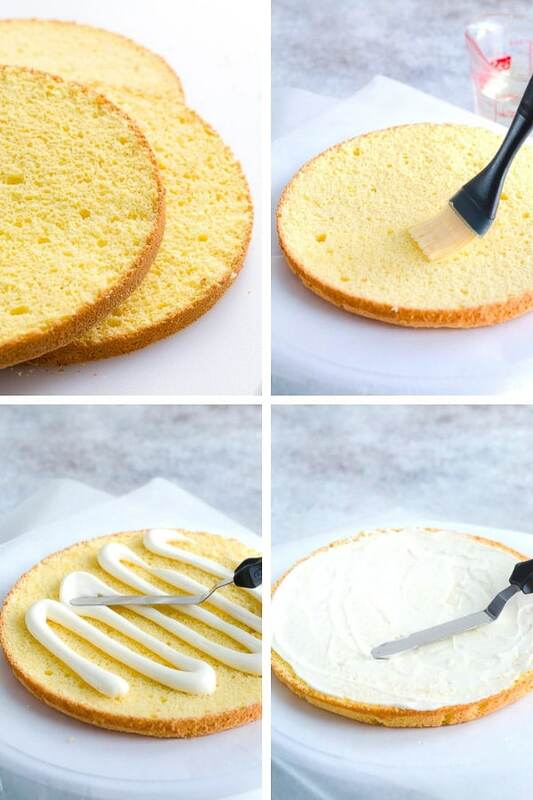 Coat the entire cake with frosting and smooth it with an offset spatula. 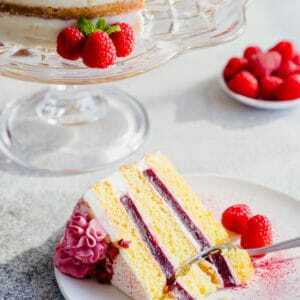 Mix the remaining cream cheese frosting with freeze-dried raspberry powder and decorate the cake as desired. I used Wilton M1 piping tip to pipe the decoration on top. Note 1: You can crush these freeze-dried raspberries with a rolling pin, or use this powder version. 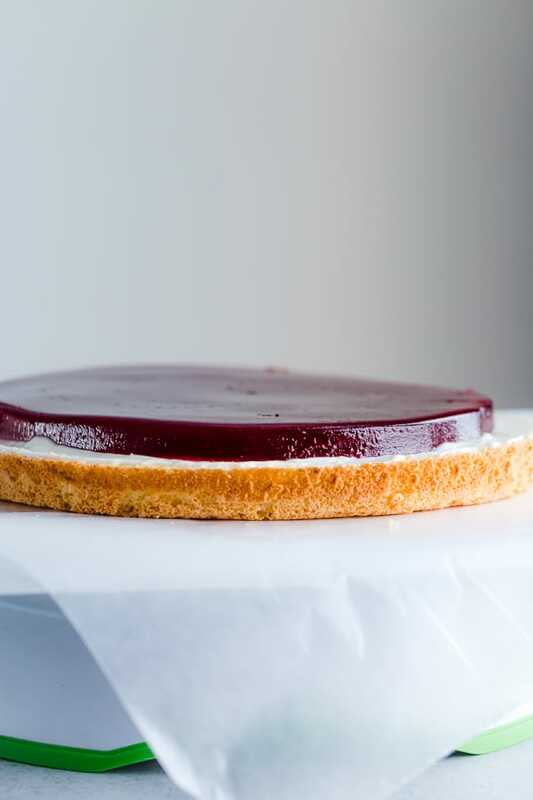 Make-Ahead Tip: You can make all the components of the cake separately well in advance. 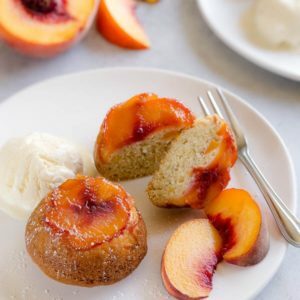 Cake can be made and frozen up to a month in advance, or refrigerated for up to a week. Thaw frozen cake in the fridge overnight. Cream cheese frosting can be prepared up to 3 days in advance. Cover with a plastic wrap and refrigerate. Re-whip before using. Simple syrup can also be made a week in advance. Refrigerate until ready to use. 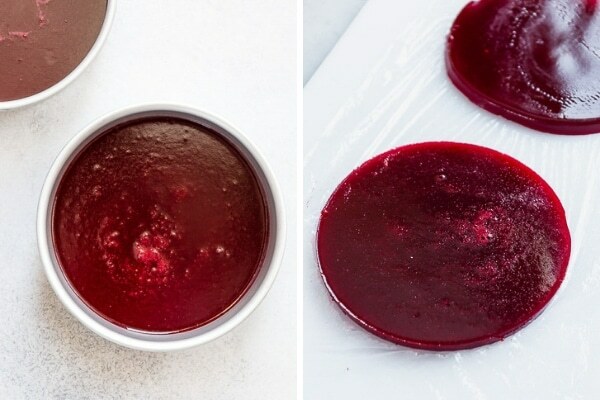 Raspberry jello can be made up to 3 days in advance. You can assemble the cake 1 day in advance and store it in the fridge. Bring it to room temperature before serving. 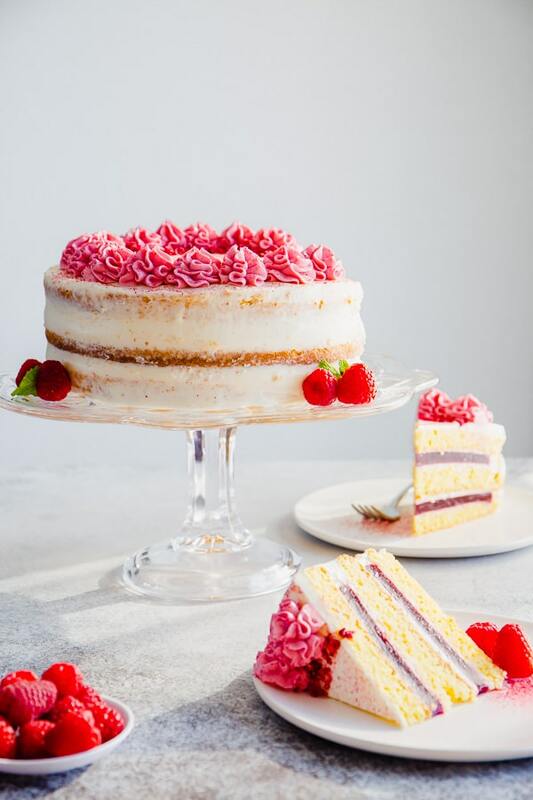 Im looking forward to making this weekend and wondering if the recipe makes ample frosting to fill, frost and decorate as shown? About how much should i use between layers to ensure i have enough remaining to frost and decorate? Hi, Teri. I’m so excited for you to try this recipe. For this cake, I had about 2/3 cup of frosting leftover, so it’s definitely enough as long as you’re planning on naked-style cake as pictured. I didn’t measure how much frosting I put in between layers, but if you look closely at my step-by-step photos the layer of frosting is not very thick, but it’s not super thin either. Hope this helps. Let me know how it turns out. I can’t wait to make this cake, it looks fantastic. What do you think about adding lemon juice to the syrup part to give it a hint of lemon flavor? Thank you so much, Mila! Lemon juice in simple syrup would be a great addition. I’ve done it in my lemon cake.